We live in a time in which taking pictures is preposterously easy: take out your phone (assuming it wasn’t already in your hands), point it at something, and tap the screen. The camera hardware and software in even basic smartphones today is good enough that you don’t need to give it much more thought than that to get decent pictures. But what if you want to do better than just decent? Ideally you’d take photos lit by high temperature lights, but failing that, you might need to compensate by adjusting the white balance during post-processing. But to accurately adjust white balance you need a pure white reference point in the image. Thanks to some diligent research by the folks at the FastRawViewer blog, we now have a cheap and widely available source for a pure white reference material: PTFE pipe tape. Alright, we know what you’re thinking: how hard could it be to find a white object? Well, if you’re talking about really white, it can actually be quite difficult. Take a walk down the paint aisle of your local hardware store and see just how many “whites” there actually are. Think the shirt your subject is wearing is really white? Think you can use the glossy white smartphone in their hand as a reference? Think again. By taking a rubber eraser and wrapping it with a few layers of the PTFE tape, you can create a white reference that’s so cheap it’s effectively disposable. Which is good, because protecting your white reference object and keeping it clean can be a challenge in itself. But with a PTFE tape reference, you can just chuck the thing when the photo shoot is done. Combine this cheap white reference with some of the DIY photography lighting setups we’ve covered in the past, and you’ll be well on the way to getting better images to document all your projects. Just remember to submit them to us when you’re done. Gray is actually preferable, as it gives you more range to correct the chanels. With a white target, at least one chanel will remain on a gain of 1. With a gray chanel you can normalize the overall gains, so that their average is 1. Yep. 18% Grey is recommended. Grey cards are for exposure. They can easily have bleaching or other treatments that harm their spectral neutrality. This is why the WhiBal was created. Also, due to the logarithmic nature of our perception of light, and the associated ‘S’-curves for turning linear RAW files into something useable for human eyes, the 18% grey luminosity is a not-the-best choice for color correction. I carry a credit card size 18% grey card in my wallet for just this purpose. 18% gray has been the photo industry standard for half a century or more. The girl friend uses 50 shades of gray..
White can be overexposed and mess up color correction. That’s why grey is better. But it has to be neutral grey to get correct compensation, otherwise you can still get color shifts. Black and white cards are usually used for optimizing dynamic range with lighting, and grey is used for white ballance. Yes, i have a sheet of white teflon here in the lab, that works far better than it has any right to for 1000-1700 nm range. The spectralon still outperforms it, but the teflon certainly has better scratch resistance! 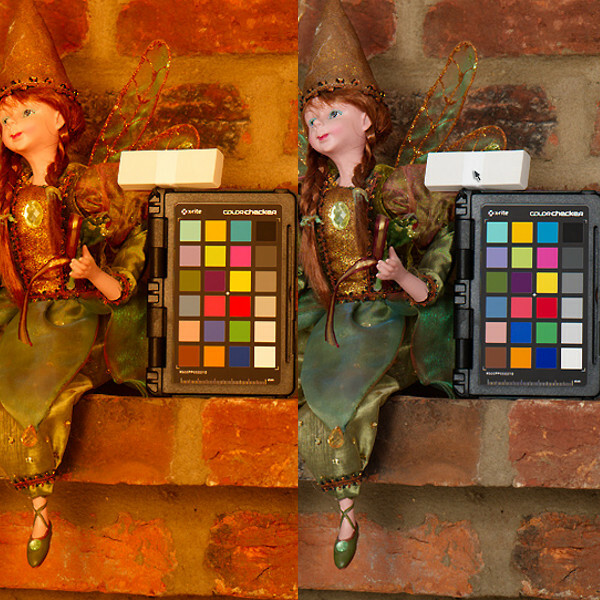 It’s a nice trick but when you process the image, white balance is very subjective. Getting into the ballpark is usually all that matters, unless you want your photography to be used commercially, at which point there are better ways to do it. This also fails if shooting in mixed lighting ie incandescent and outdoor light or with fluorescence or even worse sodium vapor lightbulbs. At that point going greyscale is your only option, or recolor it manually (or using ai). I never experienced custom white balancing as being so critical that I needed to carry my own reference. If something looked white to me in a certain situation, then that would be the reference. The difference between various whites and the resulting images are minimal if noticeable at all. Grey also works just fine because the reference image is used not for exposure, but for colour values, although it can be tricky to determine on site what is grey. Often blueish gray looks like gray and using that will result is overly warm pictures. In the same way, off-white towards the red/yellow side can result in overly cold tones. Of course this can also be used to your advantage. If you want to “warm it up” or “cool it down” in camera, you could purposefully choose a bluish or red/fellowish white. but for generally acceptable white balance, a sheet of A4 shot out of focus is fine most of the time. If not sure, also save the RAW file so you can get the right tone in post, but 99% of the time this will not be a problem. One of the tricks was using cap from Pringles chips can on the lens and taking photo as reference for white-balance compensation of other pictures taken in same light. Hmm. I tried this just now, but ended up with a pink tint. On a related note: The human eye selects the lightest “White” card/object as white, even if slightly off. A photography class I attended was taken on a tour of the Los Angeles KODAK.facility. A slide show popped up a “White” image, and then, a ring around the white showed the original was actually a bit off. This continued several times, impressing all students the the eye does indeed see that way. Yes! PTFE Tape is basically sintered PTFE, so it’s a cheap (and, somewhat lower grade alternative) to Spectralon. If you are doing diffuse reflectance spectrometry, it makes a pretty good, inexpensive reference for “100% diffuse reflectance”. For a good laugh, go price PTFE tape, and then go price a few Spectralon targets. Interesting… my first thought was a grid of certain paint swatch’s. We’d us Sintered PTFE with Titanium Dioxide or PTFE in vials as a 99% reflectance background standard on the FT-NIR’s. There were also other standards with Erbium Oxide, Dysprosium Oxide and Holmium Oxide sintered in PTFE. I was planning on making some custom glass rods to use as NIST traceable secondary standards for the vial holders at those vial diameters and it got strange in methville. I was working on custom cells also for liquids and suspension too as well as those presentation standards. Also, I was working with the 99% Titanium Dioxide doped sintered PTFE as a backing and as a background scan standard and looks like NIST just used the sintered PTFE backing ultimately. Woops… I forgot. Looks like X-Rite sold Labsphere also this year. I recall when X-Rite bought them as my grandfather had owned some of their stock and now looks like Danaher bought X-Rite. Looks like Tektronix is part of Fortive that was spun off of Danaher in 2016. Interesting. Dave Zirkle liked ESP cookbook. Alessandro wrote a comment on PewPew Mini.